Thanks to The Dice Coalition’s own Memmek2k (check out their website at http://dicecoalition.com/ for tons of awesome Dice Masters content), we now have additional information about the OP kits. I’ve added the text description below. Excellent news! We will have brand new Dice Masters OP kits this winter. I know there was some concern in the community after the switch to LCG, but it seems like Wizkids will be continuing to give us OP kits after all. Hurrah! We have four kits announced, all Marvel-themed so far. Plus, we have pictures of one card for each OP kit. All of them are full-art cards with unique art, all of them are brand-new versions of the characters. 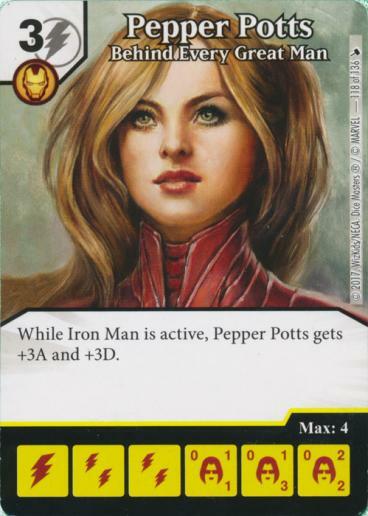 Note that this card is using the Avengers Infinity dice. Interesting that we see the return of the OP Iron Fist’s ability, though we’ll have to see if this ends up seeing use over the fantastic Widow’s Bite. 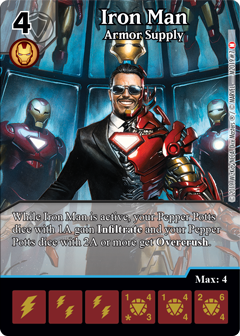 Seeing an Iron Man that’s there to support Pepper Potts is novel and absolutely fantastic. Overcrush doesn’t sound that crazy on Pepper…until you realize that it’s “2A or more”…I know one Pepper that just got a lot more interesting. Not much to say about that one: Another cheap Infiltrate character. however, the fact that it’s really hard to KO makes it much more likely that it will go unblocked. Interesting. Targeted removal that will almost always be useful (can KO Shriek at any level! ), fantastic fielding costs, with the global that made Hawkingbird into a meta staple? This has serious potential. Too bad we have to wait until April to see it. 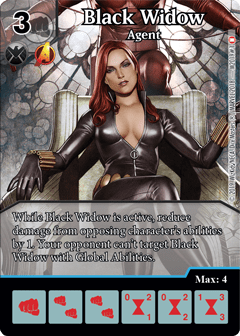 I’m really into that Black Widow – great text, great cost, great artwork, and a bonus affiliation. I can def see her getting used over the force attack. I’d missed that bonus affiliation. Nice catch! 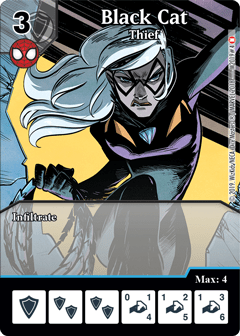 She could be fantastic as anti-Attune in Team Up teams. How old are these OP’s really? I posted about them as soon as I saw them, so as of now, 3 days old (in terms of how long they were public knowledge). As for how long ago they were created, I wouldn’t know; I have no insider info on this. Some of these OP cards are gorgeous! I eagerly anticipate announcements for DC themed OP kits for the 2019 year. Agreed! For now, though, I’m just glad we’re seeing the OP kits coming back next year. On the DC front, though, with the Justice set coming soon, maybe we’ll see some Alex Ross full-art promos? (love his art style; still want to get my hands on the RDW Joker) That would just be beautiful. 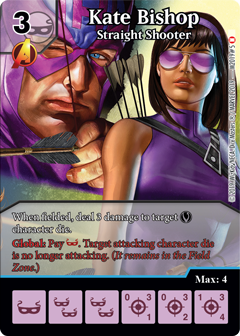 Alex Ross full-art promos sounds wonderful! Personally, I would love to see the Alex Ross Teen Titans either as an OP set or a team pack. Robin, Kid Flash, Speedy, Wonder Girl, and Aqualad all made appearances in Justice. We are already getting Beast Boy in the Doom Patrol pack.